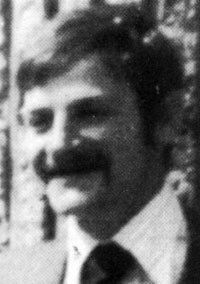 CORRECTION – Tommy Tolan was shot dead by the Official IRA in 1977 during a feud between the Officials and the Provisional IRA, and not by undercover soldiers. The full section of the watchkeeper’s log kept by the King’s Own Scottish Borderers (KOSB) dealing with the alleged IRA informer Kevin McKee has now become available and this, along with the memories of one of McKee’s comrades in the Ballymurphy IRA, raises an intriguing question: was the incident described in the log – the betrayal of an arms dump – the lever that began his ill-fated career in the MRF (Military Reaction Force)? ARREST 22:50 Sgt McVeigh lifted two men from the street. Kevin McKee, 50 Glenalina Park (Alias Frank[?] 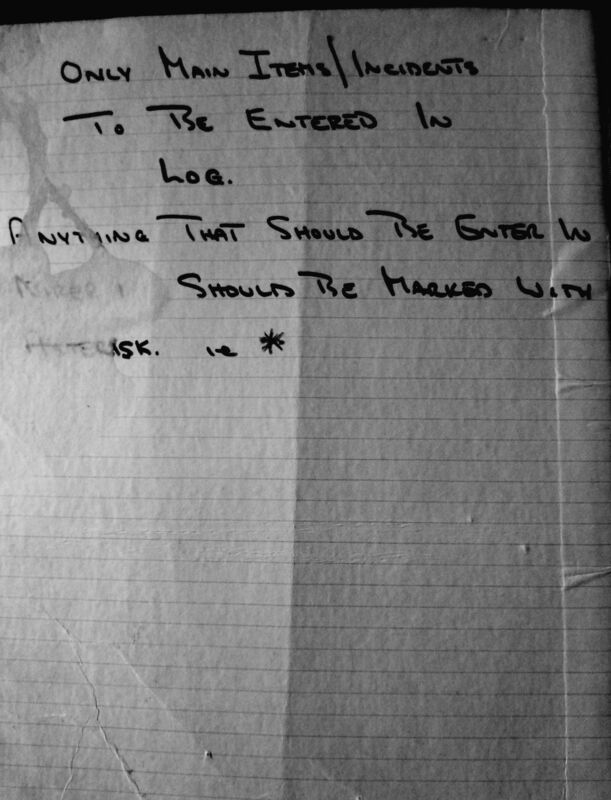 [illegible]) and Harry Hilary Tolan, 53 Ballymurphy Road. They were both arrested. Kevin McKee gave information to search 57 Westrock Dve. The log then goes on to list the five weapons and some 1600 rounds of assorted weaponry found at the address given by McKee. 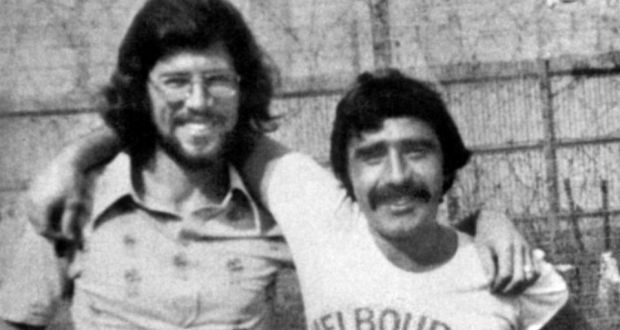 A former IRA source who knew both McKee and Tolan, who was a younger brother of Tommy ‘Todler’ Tolan, shot dead by undercover soldiers in Ballymurphy five years later, recalls that Hilary Tolan was interned afterwards on the prison ship, The Maidstone. But McKee avoided internment when he allegedly escaped from Springfield Road RUC station where both he and Tolan had been taken after their arrest by Sgt McVeigh. The police station doubled as a British military HQ in West Belfast and the claim that McKee had escaped, puzzled his comrades at the time. “People were scratching their heads and asking how did he get out of there?” the source said. Springfield Road barracks was considered near escape proof by IRA activists who had been held there at this time. 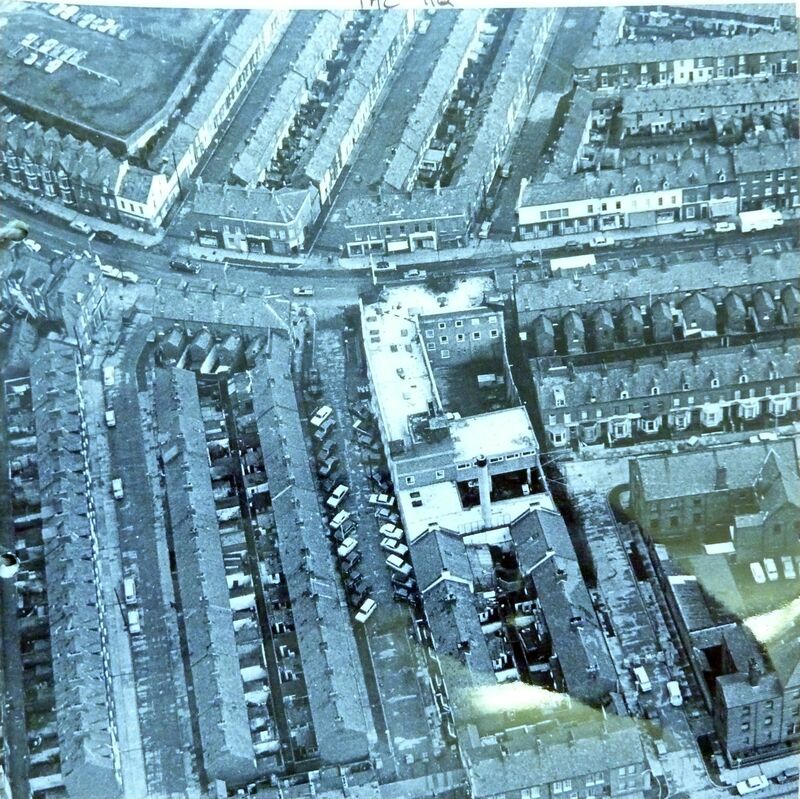 Here is a contemporary photo of Springfield Road barracks, known officially at the time of McKee’s alleged escape as KOSB TAC HQ. It is the whitened building in the centre of the picture and a glance will tell you how improbable was the idea of escape. The KOSB’s were probably confident that the IRA would not come to that conclusion because the organisation had no coherent, systematized way of tracking down informers. Spy catching and the intensive debriefing that is an integral part of that, was left to individual company intelligence officers whose abilities and skills varied. It was not until after the mid-1970’s that the IRA created a dedicated security unit to do this job. Tolan and McKee were arrested at 22:50 and the house identified as holding an arms dump by McKee was raided by KOSB soldiers at seven minutes past midnight, just seventy-seven minutes later. So, either McKee had broken very quickly under military interrogation (and by some accounts military custody could be a very brutal experience, while McKee was a slight figure weighing around nine stone, or 125 pounds) or the arrest was a pre-arranged ruse to enable him to pass on the intelligence about the arms dump. 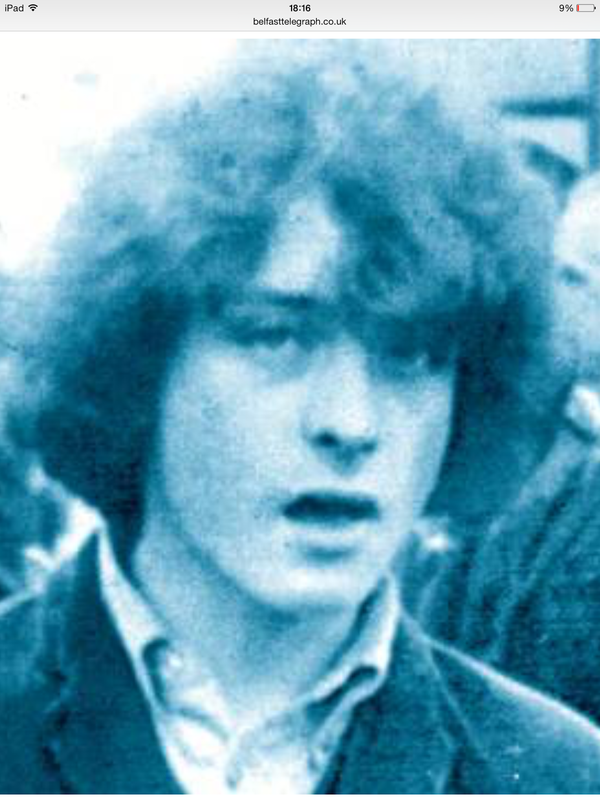 Kevin McKee – did he really escape from Springfield Road RUC barracks? The distinction is important. If his arrest with Tolan was a ruse then it is likely that Kevin McKee had already been recruited by the British military and this record was an account of just one of possibly many meetings with his handlers. If, however, he broke on the night of the arrest and was recruited at that point, then this watch-keeper’s log may be a unique document, recording the moment when an IRA activist was recruited into one of the British Army’s most notorious undercover units active during the Troubles. In February 1972, the MRF was nearly eighteen months old and judging by the enhanced role envisaged for it in major operations by military leaders such as Sir Harry Tuzo, GoC in 1972, it was well regarded by senior officers. The MRF consisted of two sections; one, composed of regular soldiers, carried out special operations, including surveillance, and was involved in controversial drive-by shootings; the other was made up of agents, known as ‘Freds’ by their handlers, who had been recruited from paramilitary groups. The possibility that the log records the moment McKee was recruited to the MRF is strengthened by a code, in the form of an asterisk at the top of the relevant page, denoting that the information on the page should be sent to Brigade, i.e. British Army headquarters in Belfast, where much of the MRF’s work was planned. 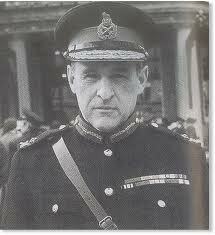 The architect of the MRF, which appears to have been mostly active in Belfast, was General Frank Kitson who headed the Brigade in Belfast and, ironically, was awarded a CBE for his service in Northern Ireland a week after the watchkeeper’s log entry was made. On the other hand the asterisk might just denote the need to inform Brigade of another success notched up to an MRF recruit. Either way the watchkeeper’s log provides a fascinating glimpse into the early days of the intelligence war between the IRA and Britain. Today (Sunday), two detectives from An Garda Siochana visited the home in Drogheda of former Boston College researcher, Anthony McIntyre. Citing a request from the PSNI made under mutual legal assistance provisions between the UK and Ireland, the detectives put a number of questions to Mr McIntyre on behalf of the PSNI. The exchange was brief and polite and Mr McIntyre declined to answer the questions. On Saturday, April 4th, 2015 The Marian Finucane Show on RTE Radio One, broadcast a near thirty minute segment devoted to interviews with relatives of four people ‘disappeared’ by either the IRA or the INLA. The victims were Kevin McKee, Columba McVeigh, Seamus Ruddy and Joe Lynskey. Coincidentally the programme was aired just before Gerry Adams’ controversial interview on CBS Sixty Minutes, but was prompted by a renewed dig at a bog in Co Meath in the hope that this might locate the remains of three IRA victims, Kevin McKee, Seamus Wright and Joe Lynskey. Apparently the dig has been at least partially successful. The remains of two people have been found and there is speculation that they are Kevin McKee and Seamus Wright, IRA members who were ‘disappeared’ in 1972 because of their associations with a shadowy British Army unit called the Military Reaction Force (MRF). The Marian Finucane programme can be heard in its entirety at this link. I am prompted only by outrage at a piece that appeared on the front page of The Irish News on Friday, to make reference to an exchange in that interview between Marian Finucane and Marie Lynskey, niece of the missing Joe Lynskey. In that Irish News’ piece, the paper’s so-called star reporter, Allison Morris claims credit for revealing the ‘disappearance’ of Joe Lynskey, even though both she and her editor, Noel Doran, know that the real story is much more complex and that to make such a claim is both misleading and in the worst of taste. The real story of how the world learned about the ‘disappearance’ of Joe Lynskey began when Boston College researcher, Anthony McIntyre sat down with former IRA commander Brendan Hughes and interviewed him about his life as a republican activist. In the course of the subsequent interviews, Hughes told what he could recall about the death and disappearance of Joe Lynskey. It was one of many stories that he told. When Hughes died and we attempted to fulfill his wish that his life story then be told to the world, it was necessary to confirm the Joe Lynskey story and to add in details that Brendan Hughes had either forgotten or did not know. The Lynskey family also had a right to know what had happened to him. In fact we did not know what, if anything they did know about the man’s fate, but when I eventually made contact with a nephew, Tony Lynskey, it was obvious they had no clear idea of what had happened. I was planning a trip to Belfast in the early summer of 2009 anyhow and so I arranged to meet members of the Lynskey family in an hotel in West Belfast. There I told them what I knew. They had an absolute right to know, even though I guessed that, West Belfast being West Belfast, there was little chance that my revelation would remain secret. That is what I believe or suspect happened next. The news spread and fair play to Morris, she came across the gossip and developed it into a story. At the time she probably thought that she was the first to break the story but five years later, knowing all she and Doran must now know about the Joe Lynskey story and how it really became public, The Irish News has no right to claim that they exclusively revealed it to the world. In her interview with Marie Lynskey, Marian Finucane dealt with how exactly the family had found out about Joe’s death and disappearance. The exchange starts at the 21:53 minute mark on the tape. Marian Finucane: How did you find out? Marie Lynskey: Ed Moloney rang my mother’s home, my sister, and he arranged to come over from America. Well we actually thought that maybe he’s met Joe in America and Joe had died and he wanted to let us know. But then he told us he was a ‘disappeared’, which was, I suppose, naive of us not to think that he was. In 2009 the Irish News revealed that Joe Lynskey was lured to his death by the IRA and secretly buried. On December 7 2009 the Irish News carried a front page exclusive story revealing that west Belfast man Joe Lynskey had been murdered and secretly buried by the IRA. The article was the culmination of a lengthy investigation by myself. Tracking down information on the former IRA intelligence officer was difficult, but eventually former republicans who had observed the law of Omerta for almost 40 years began to reveal details of the events surrounding his disappearance in 1972. The controversial circumstances surrounding his murder and clandestine burial were initially only known to a few members of the IRA. A Monaghan man who was a member of a small IRA unit guarding Mr Lynskey in the days leading up to his death later contacted me to give further details about the murder. He claimed Mr Lynskey was held in an IRA safe-house between Castleblayney and Carrickmacross, Co Monaghan, some time in August 1972. The victim was in the house for more than a week waiting for senior IRA members to arrive from north of the border to carry out an internal “court martial” which sealed his fate. Old Bailey bomber Dolours Price also contacted the Irish News to reveal she had collected Mr Lynskey from a house in west Belfast and drove him to Monaghan. She told me he was not forced at gunpoint but went of his own free will. She begged him to let her take him to the port to get a boat to England but she said he insisted she carry out her orders. 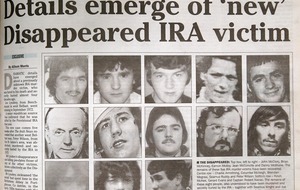 Following the publication of the Irish News article the IRA was forced to issue a statement admitting their role in killing the west Belfast man. Mr Lynskey fate was sealed after he had a relationship with the wife of another IRA man and, acting without the sanction of the organisation he ordered his love rival be shot. The man survived the gun attack but confusion around who ordered the shooting lead to raised tensions between the then fledging Provisional and the Official IRA who it was initially thought carried out the murder attempt. In February 2010 the Independent Commission for the Location for Victims Remains (ICLVR) added him to the list of people they were looking for. 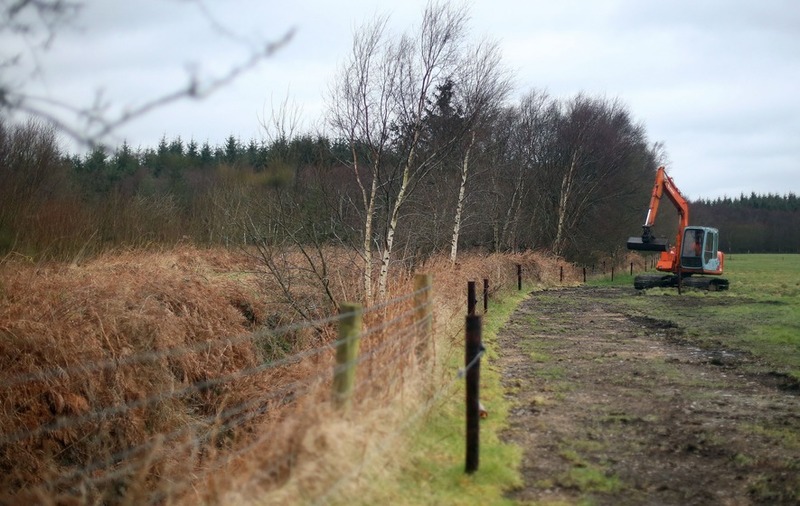 Former IRA members cooperated with the commission giving details of a site in Coghalstown, County Meath where he had been secretly buried. A niece, Marie Lynskey, bravely came forward and made repeated appeals for information about her uncle to help find his remains and finally give the deeply religious former monk a dignified Christian burial. Remains have now been found and while the state pathologist will begin the process of postmortem and of formal identification it is widely believed that almost 43 years after his disappearance they are the remains of Joe Lynskey. Does British Army Document Confirm Kevin McKee’s Role As IRA Informer? The document below is an extract from a British Army ‘watch-keeper’s log’ which appears to show that Kevin McKee, killed and disappeared as a British spy in 1972, and whose body may have just been found in a bog in Co Meath, betrayed a significant IRA arms dump containing five weapons and some 1600 rounds of ammunition. A ‘watch-keeper’s log’ was a record of all incidents, searches, arrests, lifts, finds or contacts reported by military patrols during a tour of duty. 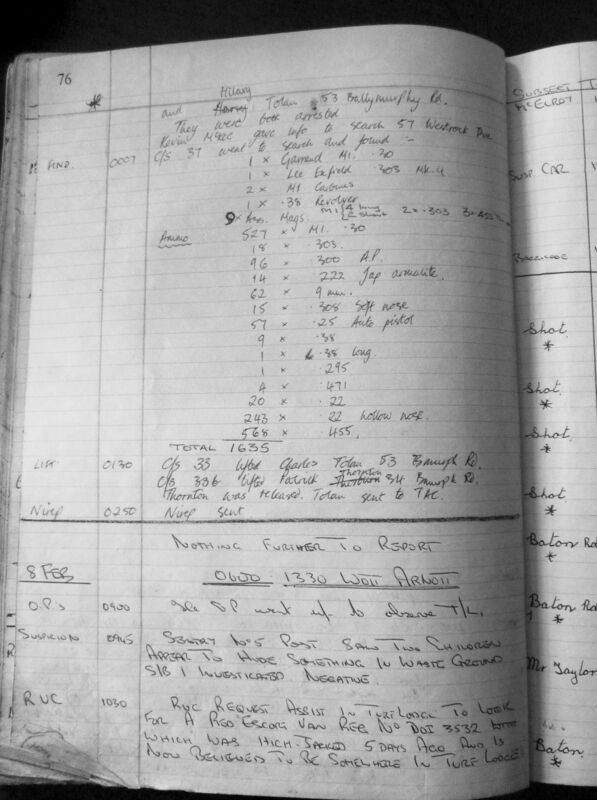 Such logs were kept at each level of the British Army from company level, which this extract appears to be, to Battalion level, Brigade and HQNI, i.e. at Thiepval Barracks in Lisburn. 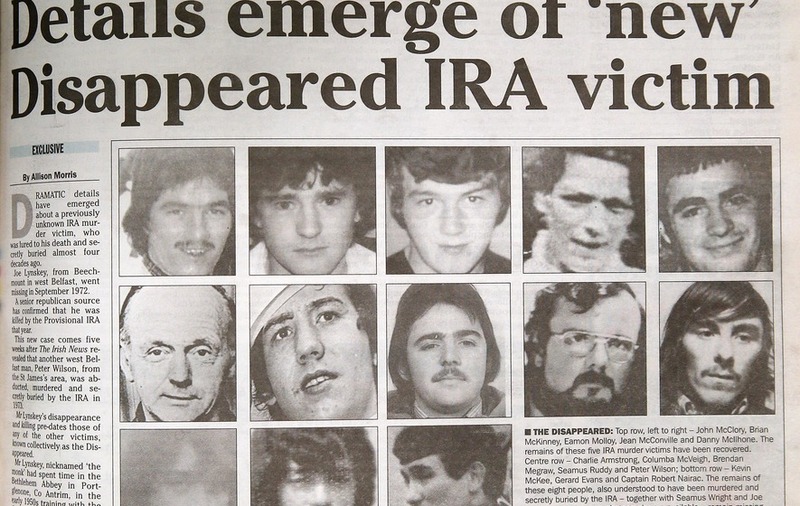 Kevin McKee – did he tell British Army to raid arms dump in Ballymurphy? The relevant extract reads: “Kevin McKee gave info to search 57 Westrock Drive.” The log then goes on to say that a search was made at seven minutes past midnight and then lists the weapons and ammunition discovered. It is important to retain a degree of caution about the identity of the informer. There may have been more than one Kevin McKee acting as an informer at this time but as it stands, the document appears to suggest that the IRA may not have been wrong in accusing him of being a spy. Here is the extract. Click to expand. We can now confirm that this ‘watchkeeper’s log’ was kept by ‘C’ Coy, 1st Btn, Kings Own Scottish Borderers (KOSB) which served in Ballymurphy between 28 December 1971 to April 24, 1972. The asterisk at the top of the page (see below) indicates that everything on that page should be sent to Brigade, i.e. 39 Brigade which included Belfast-based military units. This may have been because McKee was a member of the MRF (Military Reaction Force) and anything concerning that unit would have been of interest to the Brigade staff. CS 37 (call sign 37) is the codename for the officer who led the raid. I wonder if this article in The Daily Mail of June 2012 is one of the unspoken factors in the row that has erupted in the Sinn Fein organisation in East Cork, where one activist has been expelled and another suspended for a year? Hat-tip to SB for this. Sinn Féin TD Sandra McLellan has questioned the party’s policy of only paying its TDs €34,000 a year while taking the rest of their salary for the party’s use. In an exclusive interview, Mrs McLellan warns that the policy could prevent well-paid professionals from standing for election. And the TD for Cork East adds that she struggles to afford make-up and hairdos – which she believes are important for a woman in politics. ‘I’m finding it tough,’ she admitted. Her comments come amid reports from senior party sources that there are growing rumblings within Sinn Féin about the policy, under which most of a TD’s €92,672 salary is taken by the party. Each TD is left with €34,000 a year, the average industrial wage. However, some TDs have complained that certain SF stalwarts are supported by the party in other ways, and never appear to have to put their hands in their pockets to cover the incidental expenses connected with being a politician. She has found that the move from Cork County Council to the Dáil (to which she was elected in 2011) is taking more money out of her pocket. Sinn Fein TD for East Cork, Sandra McLellan at Leinster house on Kildare Street, Dublin. ‘As a woman… I know appearances are important when you’re sitting in the Dáil,’ she said. ‘You know you have to maybe get your hair done a bit more often, maybe put a bit more into make-up and a bit more into clothing than you would normally put. From that side of it, it can be expensive. The Irish Mail on Sunday asked Mrs McLellan if she was finding it difficult to survive the recession. Mrs McLellan, from Youghal, is a married mother of three children. She has a mortgage, a daughter in university and her husband has also been made redundant. She was elected to Youghal Town Council in 2004 and became the first Sinn Fein Mayor of Youghal in 2009. In the same year, she was elected to Cork County Council. Mrs McLellan has not yet spoken to party chiefs about revising the policy, but says she intends to do so before the next election. ‘No, I haven’t. Absolutely, seriously, never, it hasn’t come up. I don’t know, maybe if others are finding it difficult it may be something that could be looked at in the future. 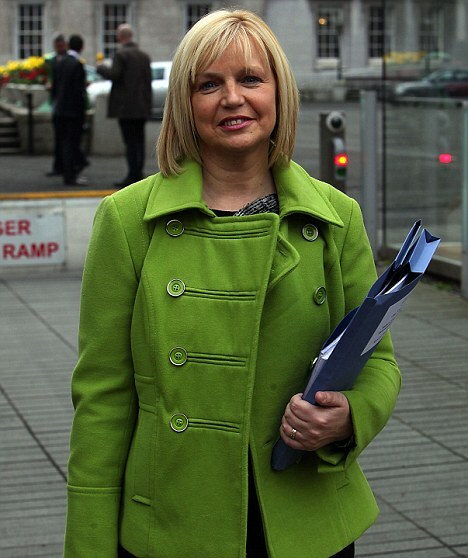 Mrs McLellan believes the party’s senior TDs Gerry Adams, Martin Ferris and Mary Lou McDonald might listen to her plea if they looked at the electoral ramifications of the average industrial wage policy. ‘It might limit attracting a person who is highly paid to run as a politician for a party if they have commitments and if they don’t want to give up their well-paid job. It might limit your gene pool. That’s something that I have thought about,’ she said. However, the TD doesn’t want to sound as if she is moaning. Ms McLellan also says that she often has to turn down needy causes through a lack of funds. Sandra McLellan gives a detailed account of what Sinn Féin does with the money it takes from its TDs’ salaries. She also explains that she does not even get access to all her monthly expenses – the party also takes a portion of the €4,982 a month she is reimbursed for expenses claims. The money goes towards paying party staff, something other parties in the Dáil don’t believe is fair. A TD is paid €92,672 a year but a Sinn Féin TD is only allowed to take home €34,000 – the average industrial wage – and the rest goes to party coffers. ‘You obviously allow for your expenses. I don’t have to pay for my hotel out of that, and I don’t have to pay for my diesel out of that,’ she said. ‘I get all that. What I normally do is keep my receipts and I have a card that I pay my hotel out of,’ said the Cork East TD. ‘Or if I have to get a train I have my card or I keep receipts for diesel and I tot it up and I’ll reimburse myself for that. ‘The rest of the money goes into paying staff within the party,’ she said. Miss McLellan is paid a fixed allowance for accommodation and travel to and from Cork, and vouched expenses as well. This has totalled €4,982 per month this year. But for the first time she reveals that Sinn Féin also takes a portion of their TDs’ expenses claim payments too. ‘I take my average industrial wage out of the Dáil salary but you get your wages paid in and you get your expenses paid on a monthly basis. I take my salary and then out of that [total] I take my expenses out as well. But the expenses are also rifled by the party. It was put to Deputy McLellan that she must also have to buy sandwiches for constituents out of her own money. She is considering raising the issue at a meeting with party chiefs. ‘It isn’t something that has come up for discussion at any party meeting that I’ve been at. Look, it might be something that might come up in the future when people think about the next election,’ she said. ‘An Rebel Og’ – The East Cork Sinn Fein Blog Behind Party Row? Is Sinn Fein finally morphing into a ‘normal’ political party, where internal disputes burst out into the open amid competing ambitions and egos, or is the ruckus in East Cork Sinn Fein just another symptom of the top-down, control freakery that has long characterised a party that was always run more like a secret army? Readers can judge from themselves. By all accounts the An Rebel Og blogsite stands as the manifesto of the East Cork malcontents and some of the things they say about the leadership are not kind at all. Click on the link and have a read for yourself.